Something fun for Friday! There are always limits, and sometimes it takes a cautionary example to show what it looks like to cross them. 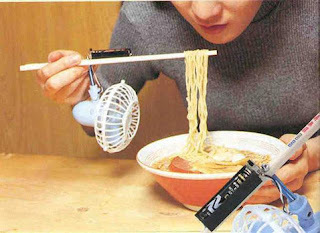 From Chinatown shops in every city (and via a 10-year anniversary post in Gizmodo), this monstrosity is the Ramen Fan. It may make sense when looking at the needs of ramen eaters (air flow to cool them down) and the tools already in use in the situation (chopsticks) - but that's where it stops being useful and starts being ridiculous. Though the only obvious drawback is the extra weight on and physical interference with the operation of the 'sticks, the intangibles are much worse: toolishness, laughingstock factor, and guffaw-ability. There are always limits. And for this product, those limits are a distant blur in the rearview mirror.